Goodreads says, "From the New York Times bestselling author of The Night the Lights Went Out comes an exquisite new novel about best friends, family ties and the love that can both strengthen and break those bonds. 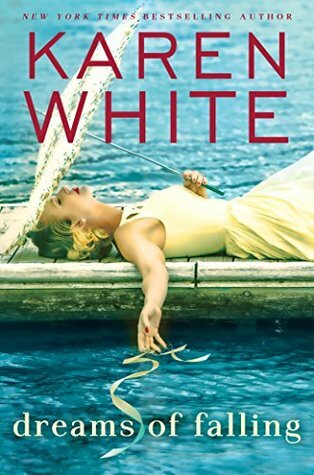 New York Times bestselling author Karen White crafts evocative relationships in this new contemporary women's fiction novel about best friends who share a devastating secret, set in the Lowcountry of South Carolina. It's been nine years since Larkin fled Georgetown, South Carolina, vowing never to go back. But when she finds out that her mother has disappeared, she knows she has no choice but to return to the place that she both loves and dreads--and to the family and friends who never stopped wishing for her to come home. Ivy, Larkin's mother, is discovered in the burned out wreckage of her family's ancestral rice plantation, badly injured and unconscious. No one knows why Ivy was there, but as Larkin digs for answers, she uncovers secrets kept for nearly 50 years. Secrets that lead back to the past, to the friendship between three girls on the brink of womanhood who swore that they would be friends forever, but who found that vow tested in heartbreaking ways." Guys, this novel screams compelling beach read, right? I fell in love with Karen White's writing style when I read The Night the Lights Went Out last year. It was the perfect combination of romance, suspense, mystery, and historical details. I have high hopes for Dreams of Falling. What do you guys think? Have you read any of Karen White's other novels? I know, right? I can't wait to read this one. Thanks for visiting, Leslie. I'm looking forward to this one, too. It does sound like a good summer read. Me too! I'm glad you agree, Angela! Thanks for dropping by. I haven't read anything by this author. It sounds like a good book. I see you are reading My Dear Hamilton - that is one I want to read too. I hope you are loving it. Great pick this week! Thanks! I am only about 50 pages in, but really enjoying it. I love the authors! Thanks for visiting. I hope you get to read a novel by Karen White sometime soon - she's fabulous if you like historical fiction! Thanks for visiting! The Night the Lights Went Out was my first book by this author and I really liked it. That's why I'm excited for this one. I hope I love it as much! Me too, Barb! I'm glad you agree. Thanks for visiting. That cover is great! I know that Karen White is so popular and I've never read any of her books. This one sounds like a great place to start. I hope you get to read her soon! Thanks for visiting, Kay! Totally! I haven't read any Karen White so looking forward to your thoughts on this. I think you'd like her, Joy. She's a great writer if you like historical fiction. Thanks for visiting. Oh, I love the dreamy quality of this cover! Definitely gets me in a summery mood! I know, right? I am loving the cover too. Could use some of that warm weather here in PA. Thanks for visiting, Becky. Definitely sounds like a great beach read ~ Enjoy! I haven't started this series yet but it's definitely on my list. Great pick ~ Enjoy! I'm glad you agree, Renee. I hope to have it in my beach bag this summer. Thanks for visiting!